Over its 300 year history, the Old Corner Bookstore has been home to commercial ventures ranging from world-famous publishers to 5-cent pizza shops, reflecting the varied and diverse history of Boston itself. From its corner at Washington Street and School Street, the O.C.B. witnessed the birth of the American Revolution in the 1770’s, ushered in a gold-age of American literature in the 1850’s, and narrowly escaped Urban Renewal movement of the 1960’s. 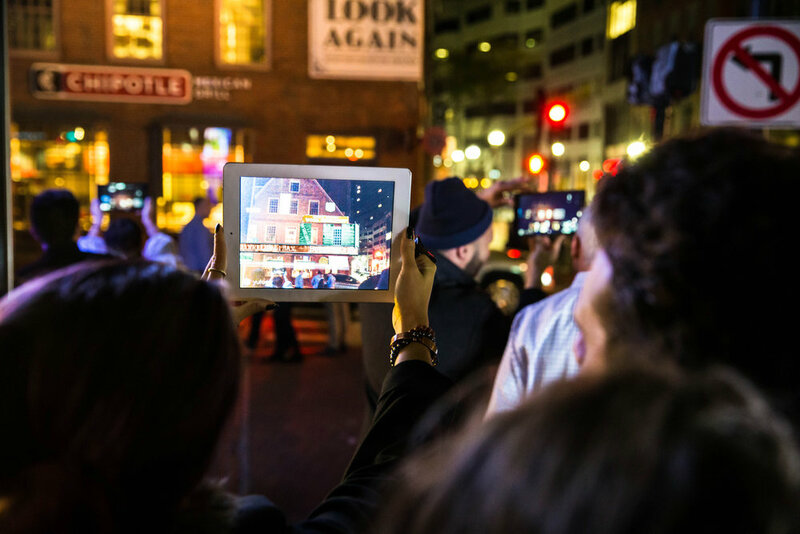 To celebrate the beginning of it’s third century of continuous use, Historic Boston, Inc has commissioned the artists Ethan Vogt, Giovanna Casimiro and a technical team assembled by Dudley Square Studios to create an Augmented Reality (A.R.) invention at ILLUMINUS that reveals the Old Corner Bookstore's past and envisions its future. This Project is Sponsored by Historic Boston, Inc.
A Massachusetts’ native and Harvard VES graduate, Ethan Vogt is Dudley Square-based visual artist and curator of immersive exhibitions. Trained as a cinematographer, he produced Andrew Bujalski’s debut feature Funny Ha Ha named “one of the ten most influential films of the decade” by A.O. Scott in The New York Times. In 2010, he established the first “nuit blanche” festival in New York City and has since curated six large-scale site-specific public art events experienced by over 100,000 visitors. Since moving back to Boston in 2015, he created workshops in public art and Virtual Reality for the Harvard Graduate School of Design, designed an interactive installation for “Neighborhood Nights” at the Isabella Stewart Gardner Museum, established “Night Gardens” a placemaking project selected for Boston’s “Public Space Invitational” competition, and curated curated the "Laboratory of Longings" an exhibition at the Boston Center for the Arts. He is currently studying vertical farming techniques. A new media art researcher, Giovanna Casimiro is PhD candidate at the Faculty of Architecture and Urbanism of the University of São Paulo, studying “the city as a museological interface.” She has worked in video mapping, physical computing, and augmented reality in Brazil, Austria, and the United States. Giovanna holds a Master in Visual Arts by the Postgraduate Program in Visual Arts (PPGART / UFSM) as well as Bachelor Degree in Drawing and Plastic, Federal University of Santa Maria. She is the former coordinator of the Research Laboratory in Interactive Environments (LPAI) and Lecturer in Digital Design at the University Center SENAC. Previous to that, Giovanna was a curator and project consultant for the interaction design studio, LILO. Her academic research focuses on the use of mixed reality in the exhibition media, working in association with "Aesthetics of Memory in the XXI Century" (FAUUSP) Research Group; LABART - Research Laboratory in Contemporary Art, Technology and Digital Media and Research Group Art and Technology (University of Santa Maria).